Will humans survive the android uprising? Paislee Hobson is born into a world struggling after a war that killed most of the world’s population. Rebuilding has been accomplished through androids developed by and under the control of The Institute. The human population has been divided into strata. Paislee, a legal clerk, is a member of the upper stratum. Her recent boyfriend dumped her. To avoid another heartache, she purchases a human-looking android companion, Pellegrin. No one suspects Pellegrin is not human. He arouses and satisfies all her desires and is a polished companion and conversationalist in public. When strange things begin to happen around the courthouse, people start acting mysteriously. Some disappear, and others are murdered. Pellegrin’s true identity surfaces as he slowly and methodically takes over all aspects of Paislee’s life. She is in turmoil trying to find a way out. The love of her youth appears, and she longs for a life that is denied to her. Can Paislee regain her freedom or is she doomed to a life under Pellegrin’s control? This book is a fantastic dystopian thriller. I loved it! Paislee Hobson is a character I struggled to connect with at first, but as I read more of the story, I liked her a little more, though her paranoia began to annoy me, even though it was justified. Paislee is a paralegal living in a future world that has gone through a cataclysmic war that left the humans struggling to cope with the aftermath. Androids were developed by The Institute to help the remaining citizens rebuild the world. 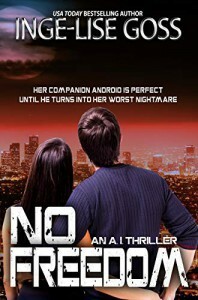 When Paislee's boyfriend dumps her, she purchases an android as a companion. But as Pellegrin's hold on her life tightens, an old flame reappears, and strange and deadly events threaten her life. When I heard that this book had been released, I purchased it without reading the synopsis. The reason for this is that I've read other books by this author and knew I was in for a thrilling adventure. I wasn't wrong! I started reading this book, told through Paislee's POV, and was immediately hooked. As the story unfolded, I found myself convulsively reading, but dreading it at the same time. Have you ever sat watching a movie with your hands over your face because the suspense is killing you and you can't watch it, but you don't want to miss anything either? This is what I felt while reading this book. The author skillfully builds the suspense so you don't know whether you should be cheering for Paislee or not, or liking Pellegrin or not. This story has the futuristic feel of Minority Report and iRobot but also reminded me slightly of one of the author's other thriller series, Tegans. There are several twists that kept me guessing, and I found myself waiting for the other shoe to drop. Pellegrin is a scary villain. He's a control freak, and his attitude is one of a dangerous psychopath and master manipulator, but this could also be Paislee's paranoia talking. His identity and role at The Institute is a mystery, but I had a feeling when reading this book that it's not what I think it may be. Then again, he could exactly be who I think he may be. I love books like this. I've always been interested in robots/androids as a concept but would be completely scared if AI ever got this powerful. Maybe it wouldn't be so bad, but it's my fear of the unknown talking, and until I learn otherwise, I'm keeping my worries alive. I guess I'll have to read the next book to find out what happens next, as the book ends on a small cliffhanger, and I can't wait. 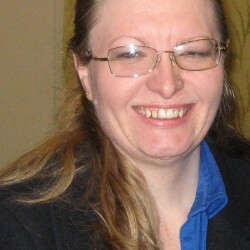 Inge-Lise Goss has written an intriguing dystopian thriller full of mystery and suspense. I love her writing style, which is fast-paced, and the flow's fantastic. I am curious to see what this author comes up with in the future.